There are 21 articles in this month. 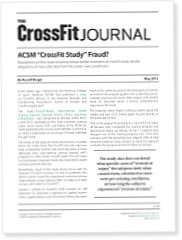 A few weeks ago, I learned that researchers affiliated with the American College of Sports Medicine (ACSM) had published a study on CrossFit’s efficacy in the National Strength and Conditioning Association’s Journal of Strength and Conditioning Research. There are 33 comments on this article. Login to add your own. Most athletes dive into the Olympic lifts without considering what really allows someone to lift the heaviest loads and move efficiently through high-rep workouts. On Episode 276 of CrossFit Radio, host Justin Judkins interviewed Carrie Rieger, who was recently crowned Mrs. Missouri. Judkins also interviewed Andrea Ager, SoCal Regional competitor. This episode was webcast live at 6 p.m. PDT on Wednesday, May 15, 2013. As a child, Annie Thorisdottir took ballet. It didn’t stick for long, though. Like her cousins, she wanted to try gymnastics. She made it to Iceland’s national team but quit to focus on high-school studies. “Going from training 24 hours a week into training not at all didn’t really work out for me,” the 23-year-old two-time CrossFit Games champion says with her quintessential smile. 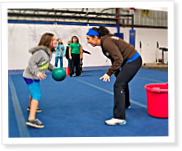 You’ve seen the game on American Gladiators, now play it with your CrossFit Kids. This kids version of powerball involves quite a bit less tackling than the TV version featuring muscled men and women named Laser and Siren, but the goals are the same: get a ball into a guarded bucket. Her failing organs were a result of Type 1 diabetes, with which she was diagnosed at the age of 5. She reluctantly agreed to the kidney transplant in 2001, a couple of years after her daughter died following a similar procedure. Her son was 18 at the time. On Episode 275 of CrossFit Radio, host Justin Judkins interviewed Chris Dozois, who won the CrossFit Games Open in the South West. Also on the show was Rainier CrossFit owner and HQ Seminar Staff member Kurtis Bowler. This episode was webcast live at 6 p.m. PDT on Wednesday, May 8, 2013. At 13, Anna Tunnicliffe decided she wanted to win an Olympic medal in sailing. And she did, taking gold in the Laser Radial class at the 2008 Olympics in Beijing. Now 30, Tunnicliffe began training at CrossFit B&S in Miami about a year and a half ago.